ARCHITECT'S NEWSPAPER | "Meet the incubators and accelerators producing the new guard of design and architecture start-ups. This is part of a series profiling incubators and accelerators from our April 2018 Technology issue. At the Los Angeles Cleantech Incubator (LACI), participating members get a lot of bang for their buck. Originally started in 2011, the outfit moved in 2016 into a 60,000-square-foot complex, known as the La Kretz Innovation Campus and owned by the Los Angeles Department of Water and Power. The campus is one of the inaugural public amenities of a new Cleantech Corridor planned by the City of Los Angeles for a vast area stretching from the Lincoln Heights neighborhood, in East L.A., to the Arts District, downtown." 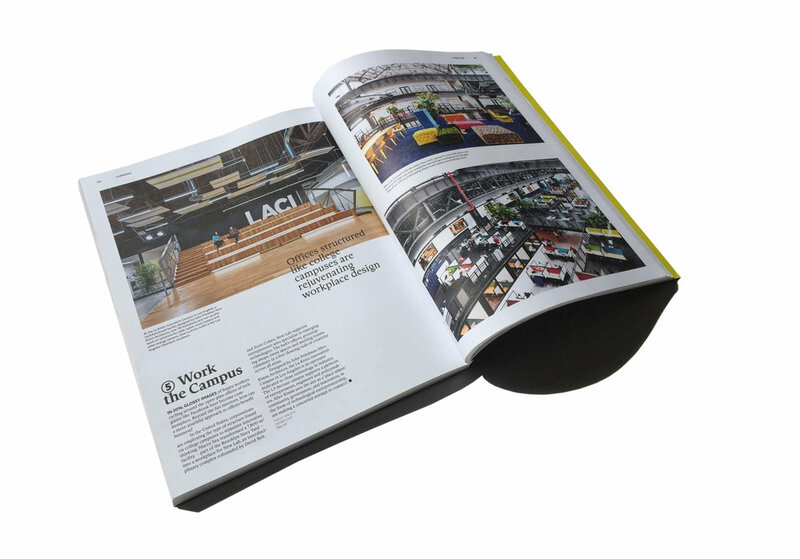 Read more on Architect's Newspaper website or in the April issue of the Architect's Newspaper! 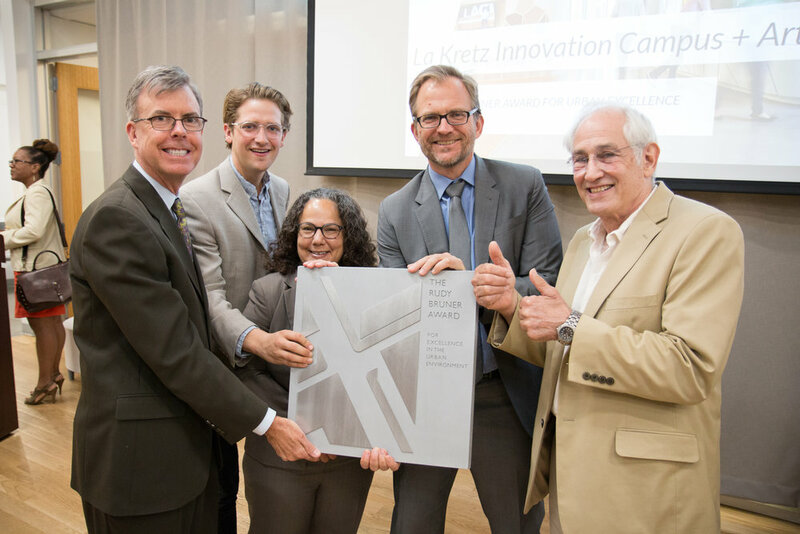 LOS ANGELES (October 25, 2017) - The La Kretz Innovation Campus was awarded the Rudy Bruner Silver Medal for Urban Excellence during an awards ceremony that took place at the campus today. 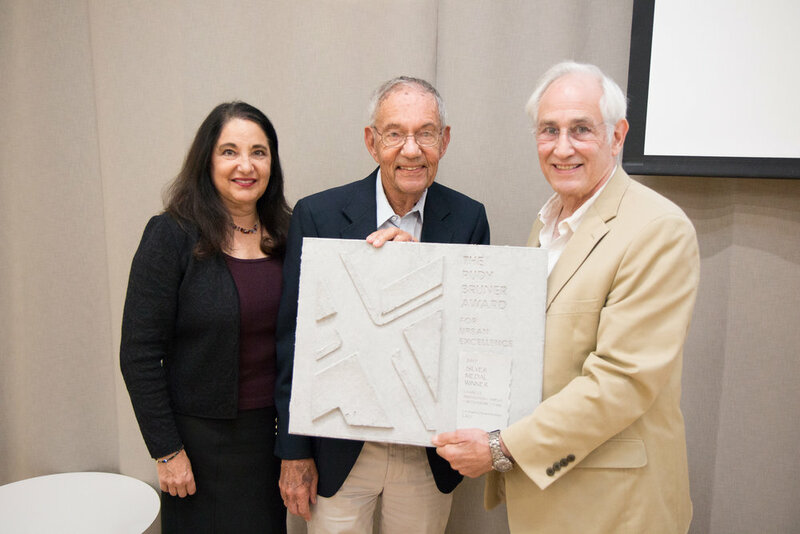 The Rudy Bruner Award for Urban Excellence (RBA) is a national design award recognizing transformative urban places distinguished by their economic and social contributions to America’s Cities. Completed in 2016, the La Kretz Innovation Campus + Arts District Park were created to position the City of Los Angeles as a cleantech industry leader and sustainable urban center. LACI's CEO Matt Petersen accepted the $10,000 award check on behalf of the campus. Funds will be used to bring students and artists from disadvantaged neighborhoods, including Boyle Heights and Watts, into the campus to learn about The Advanced Prototyping Center and work with the organization’s new Artist in Residence (AIR) program. Envisioned as an industry hub where engineers, scientists, and policymakers interact to promote the development of clean technologies and LA’s green economy, the La Kretz Innovation Campus occupies an LADWP-owned 3.2-acre parcel of land in the center of the vibrant Downtown LA Arts District. John Friedman Alice Kimm Architects is the only submitting firm in the award's twenty-year history to have two of their projects selected as finalists. Their LA Design Center was awarded a Rudy Bruner Silver Medal in 2007. Click here to see the official press release from the City of Los Angeles. LOS ANGELES (June 15, 2017) - The Rudy Bruner Award for Urban Excellence (RBA), announced its 2017 Gold and Silver Medalists, marking thirty years of honoring innovative urban placemaking. The biennial award celebrates transformative places distinguished by physical design and contributions to the economic, environmental and social vitality of America’s cities. 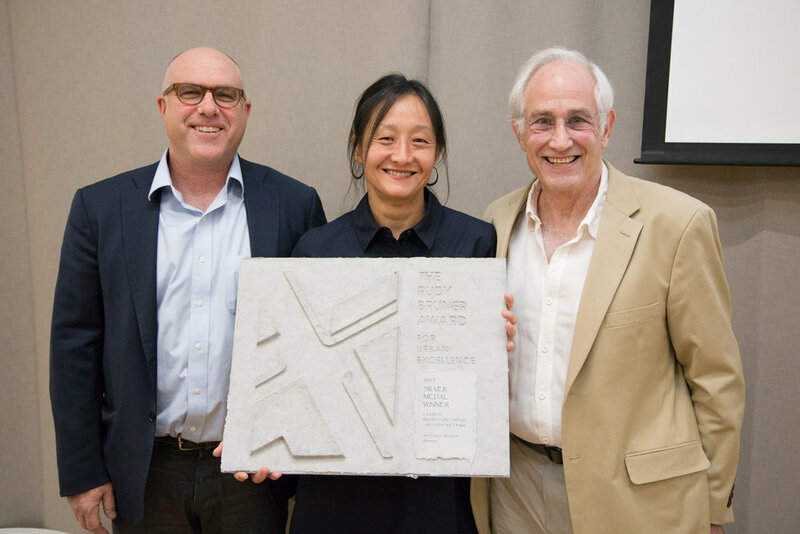 John Friedman Alice Kimm Architects' La Kretz Innovation Campus was one of five finalists, and was awarded a Silver Medal as well as $10,000 to continue its mission. “The 2017 RBA medalists illustrate the transformative power of design in creating places that bring people together and lift the human spirit,” says RBA Founder Simeon Bruner. Rudy Bruner Award entries are completed projects across the contiguous United States. Finalists and medalists are determined through an in-depth evaluation process by the selection committee involving input from the award application, site visits, interviews with project participants and community members, and committee discussions. A nationwide committee of urban experts determined the winners from among five finalists, naming SteelStacks Arts and Cultural Campus in Bethlehem, Pennsylvania, the Gold Medalist and recipient of $50,000 to enhance the project. A Metropolis magazine blog series chronicles the RBA process, site visits, and events to come. The RBA will also produce detailed case studies about this biennial’s five winning projects including findings, lessons learned, and highlights from the selection committee’s discussions. The case studies will be published online and in book form in 2018 as a resource for educators, practitioners, and students. Case studies about all past RBA winners are available on the RBA website. John Friedman Alice Kimm Architects is the only submitting firm in the award's history to have two of their projects selected as finalists. Their LA Design Center was awarded a Rudy Bruner Silver Medal in 2007. The Rudy Bruner Award for Urban Excellence (RBA) kicked off site visits to the five finalist projects, located in Bethlehem (Pennsylvania), Boston, Chicago, Los Angeles, and New Orleans. The committee is spending spending several days at each site, conducting research, and gathering additional information that they then present to the award’s selection committee in June, when they will determine the recipient of the Gold Medal and $50,000 cash prize. 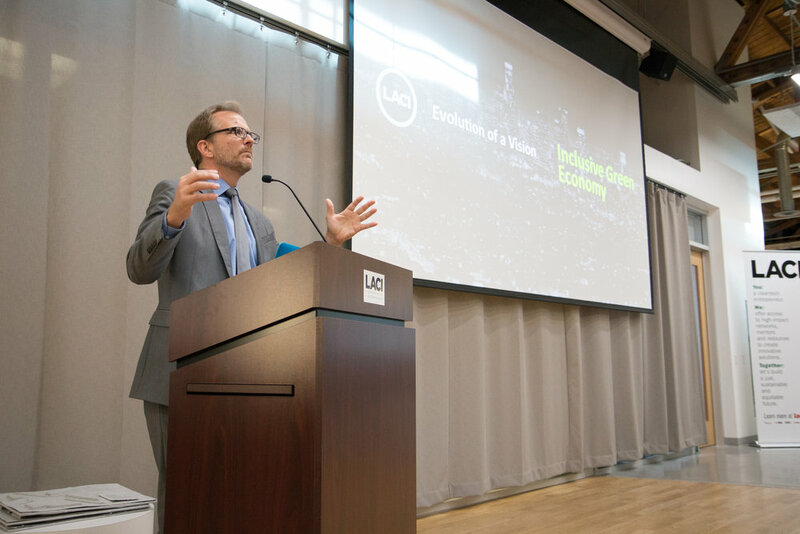 JFAK's La Kretz Innovation Campus, home to Los Angeles Cleantech Incubator and the LADWP's Customer Engagement Center, was the first stop for the Rudy Bruner Award for Urban Excellence selection committee. Click through to see the full article in Metropolis Magazine: it's is part of a series written and curated by RBA that focuses on advancing conversation about placemaking in American cities and offers a detailed look at the 2017 award cycle and site visits. Celebrating its 30th anniversary this year, RBA is a biennial design award recognizing transformative places that contribute to the economic, environmental, and social vitality of the nation’s urban center. MEXICO CITY, MEXICO (March 22, 2017) - The La Kretz Innovation Campus, a 61,000-square-foot clean technology incubation center in Los Angeles’ Arts District, received the 2017 Los Angeles and Mexico City Sustainable Real Estate Award March 22nd in Mexico City. The award honors projects that embody sustainable building practices, showcase innovative design principles, and promote civic engagement. 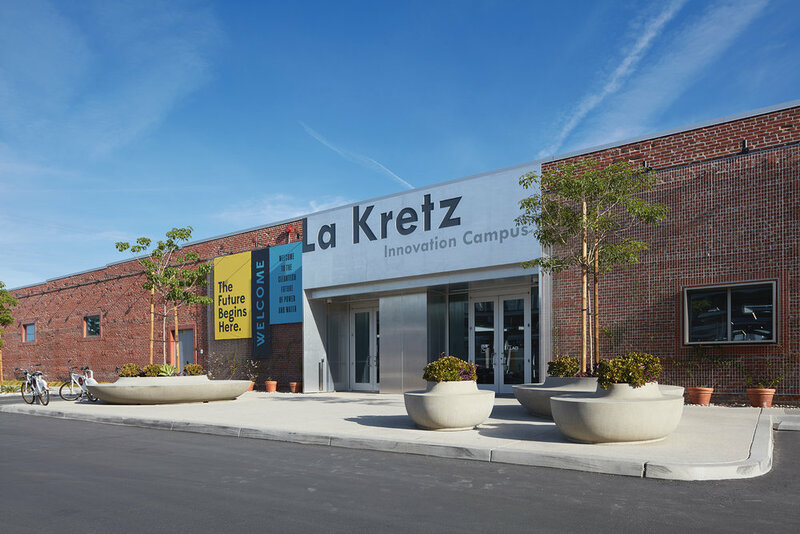 La Kretz Innovation Campus, which opened in October 2016, designed by John Friedman Alice Kimm Architects (JFAK), is the headquarters of the Los Angeles Cleantech Incubator (LACI), a nonprofit tasked to transform the city into a green-collar hub, and the anchor for cleantech investment and innovation in Los Angeles. Sponsored by the Association of Real Estate Developers (ADI), one of the most influential real estate developer groups in Mexico, the award is the result of a longstanding partnership between Mexico City and Los Angeles. Beginning with a Memorandum of Understanding signed by Mayor Eric Garcetti of Los Angeles and Mayor Miguel Ángel Mancera of Mexico City in 2014, the partnership between Los Angeles and Mexico City is a recognition of the two cities’ shared interests and business opportunities. Over the past several years, the Los Angeles Business Council has played a pivotal role in the strategic dialogue between government and business leaders in L.A. and Mexico City, including sponsoring delegations in 2013 and 2014. "Sculptural light chutes and a vibrant living wall are among the features at this adaptive reuse project by American firm JFAK Architects, for environment-focused companies in Los Angeles...The La Kretz Innovation Campus – also known as the Los Angeles Cleantech Incubator – is located in the city's Arts District and occupies an old warehouse. The goal of the facility is to "foster innovations that advance LA's green economies within the framework of an unusual public-private coalition", said John Friedman Alice Kimm Architects, or JFAK Architects, a local studio founded in 1996." Projects were selected by industry judges based on innovation, quality and teamworkThe winners listed below will be profiled in depth in the October issue of ENR California, and at two awards presentations in December.